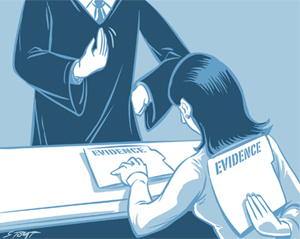 In Orange County, CA, What Happens When the Police or Prosecutor Hides Evidence? Subvert the criminal justice system. Lie to the judge. Hide evidence. Sounds like a defendant in a criminal case doesn’t it? Who else could it be? If it isn’t the criminal defendant, it must be the much maligned criminal defense attorney, right? You know who he or she is, right? He’s the one who you love to ask at cocktail parties, how can you represent those guys (defendants in a criminal case)? Well, it’s not either one of the above. In the case of the State of Texas against Michael Morton, the liar was none other than the prosecutor, Ken Anderson. 25 years ago, Morton was charged by Anderson with murdering his wife. Morton withheld two key pieces of evidence against Morton at the time of his trial. Both of these items, a witness statement and a police report pointing to another possible suspect in the murder, were hidden from the defense attorney. Not only did Anderson hide evidence, he lied to the judge during a pretrial hearing. After 25 years in prison Morton was released and the case against him dismissed when his attorneys, including those from the Innocence Project, convinced a new judge that he had been wrongfully convicted. But,what of prosecutor, Anderson? Surely, his career hadn’t flourished, had it? Cheaters never win, do they? Justice will be served, won’t it? I don’t think so and neither should you. After 16 years as the district attorney he became a judge in 2002. But, wait, it’s 2013 and now the truth has come out. The defendant is innocent and the prosecutor is guilty. So, prosecutor Anderson, excuse me, now Judge Anderson, will finally feel the full weight of the system which he represented but which betrayed the unfortunate Mr. Morton. Don’t be so naïve. Because prosecutors have immunity from prosecution for their crimes against victims/defendants, Anderson can’t be severely punished at all. No 25 years in prison for him. Instead, Anderson can’t be a judge anymore and the gray haired former public servant must give up his law license. Oh, and he has to serve 9 whole days in jail for lying to the judge. In addition, he has to pay $500.00 in fines and do 500 hours of community service. With this kind of travesty of justice becoming much too commonplace, justice for Anderson will have to wait for the afterlife where he will hopefully meet all his other, so far, undiscovered victims.